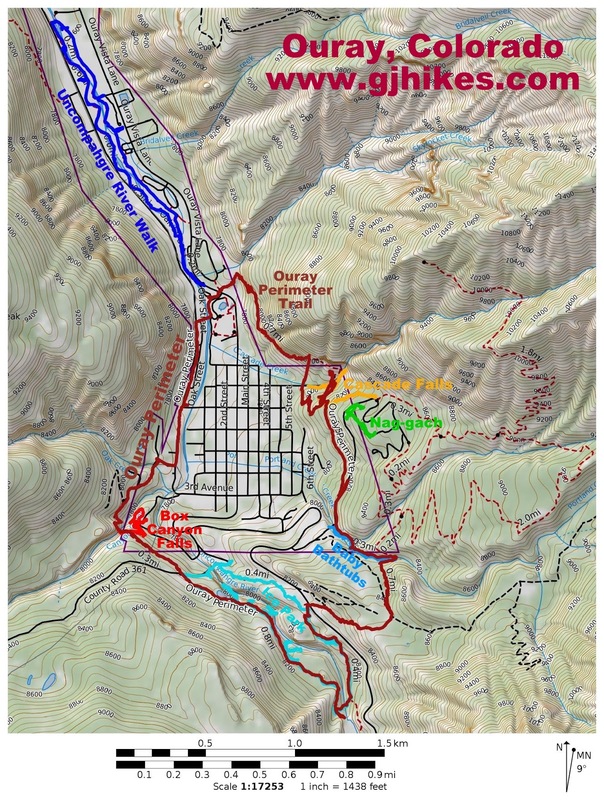 The Nag-gach trail is located near the Amphitheatre Campground in Ouray, Colorado. The short trail connects the Amphitheatre Picnic Area with the campground. At the top of the trail there is an overlook where the little hamlet of Ouray can be seen in the valley below as the rugged San Juan Mountains tower thousands of feet higher in the background. 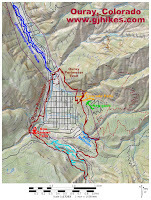 To get to the trailhead drive south through Ouray and start up the Million Dollar Highway. After the second switchback watch for a sign on the left for the Amphitheatre Campground. Follow the road for just over a half mile. The trailhead will be on the right before reaching the campground. The trail climbs a short rise that leads to the lower overlook. There is about 100 feet of elevation gain between the lower overlook and the upper one. Those that are unable to hike to the upper end of the trail probably won't be too disappointed with the view from here. Off in the distance United States Mountain (13,036 ft.) forms a backdrop to Yankee Boy Basin where Imogene Pass provides a route to Telluride. Near the trail is one of several picnic sites equipped with tables, fire ring and a grill nestled in a pleasant forest setting. From there the trail continues up the mountainside toward the campground. Switchbacks make hiking the steeper parts of the primitive trail a bit easier. The trail reaches the campground at the top of the hill. There is a restroom just around the corner to the left. Besides the health benefits from the exercise hikers are awarded with a more elevated scenic view from the upper overlook. Interpretive sign along the trail provide interesting facts about the area. This one mentions that Na-gach is the Ute Indian word for 'mountain sheep'. Another interesting sign has an historic picture of Ouray that was taken at a time when almost all of the trees had been cleared to use for firewood and other needs. It is amazing to see what the area looked like without its forest. The Na-gach, with its peaceful setting in the Uncompahgre National Forest, is a good place for families with young children to enjoy a picnic along with a short hike. The campground has tent sites plus a few spots that can accommodate small trailers. For those looking for something a little more challenging there are several longer trails nearby including Lower Cascade Falls, Upper Cascade Falls and the Portland trail. As far as the Na-gach trail goes if you would like to see it for yourself then all you have to do is 'Take a hike'.